Detached freehold house with private fenced outdoor space situated in close proximity of the the dunes of sand in Torre Rinalda, just steps away from the beach. 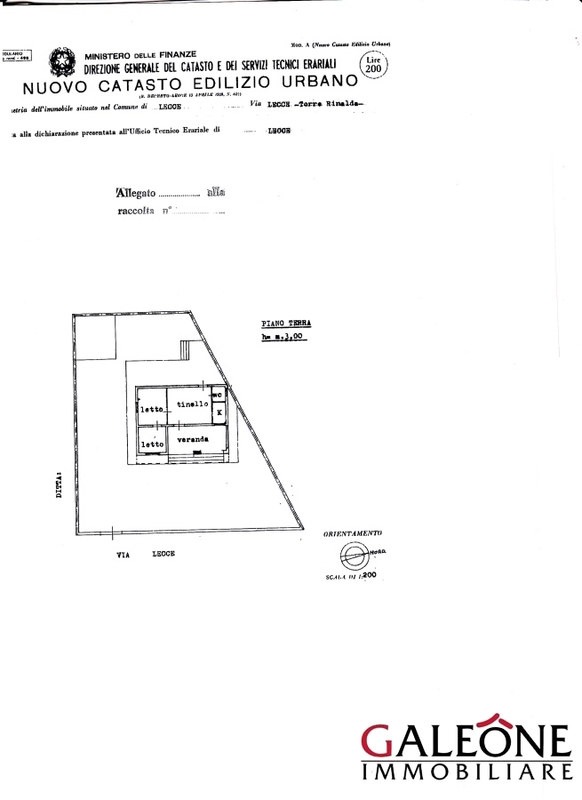 The accommodation offesr an internal floor area of approximately 60 sq. m. (645 sq.ft.) and consists of: living room, kitchen, bathroom and 2 bedrooms. Torre Rinalda is located only 15km from the city of Lecce, between Spiaggiabella and Casalabate, set within the area of the Regional Natural Park Reserve and Swamps of Rauccio. It is a marina well served and equipped with bathing facilities. Fine sand and pure and crystalline sea. For further information or to arrange a viewing, do not hesitate to contact us today. For further information or to arrange a viewing do not hesitate to contact us today on: T +39 0832 092845 - M +39 329 4074474, or email us to info@galeoneimmobiliare.com.